Mr. Rozell and his last WWII/Holocaust Studies class, June, 2017. Credit: Joan Lentini. Matthew A. Rozell was born in 1961, and raised in Hudson Falls, New York, with his four siblings—Mary, Ned, Nora and Drew—all acclaimed writers. As a kid, he roamed the banks of the Hudson River looking for lost encampments of past heroes and historic battle sites. He graduated from Hudson Falls High School in 1979 and afterwards from SUNY Geneseo, BA in 1983 and MS in 1988. In 2013, he was named a Distinguished Alumni Educator of SUNY Geneseo. In 1987 he joined the faculty of his alma mater at Hudson Falls, teaching world history, as his father had done across the river at Glens Falls. Over the next 30 years he would eventually teach every subject in the Social Studies department, specializing in the history of World War II and running summer archaeology field courses at the colonial frontier sites he had discovered along the Hudson. He created an oral history program at the high school that became the catalyst for The Things Our Fathers Saw book series he is writing. Mr. Rozell also became an authority on the teaching of the Holocaust. He reunited over 275 Holocaust survivors with their actual American soldier-liberators, described in his 2016 book, A Train Near Magdeburg. He and his former students were featured as the “ABC World News Persons of the Week” on Sept. 25, 2009, after a joyous community-supported reunion at the high school. His teaching experiences have been filmed for the CBS Evening News, NBC Learn, the Israeli Broadcast Authority, the United States Holocaust Memorial Museum, and the New York State United Teachers. 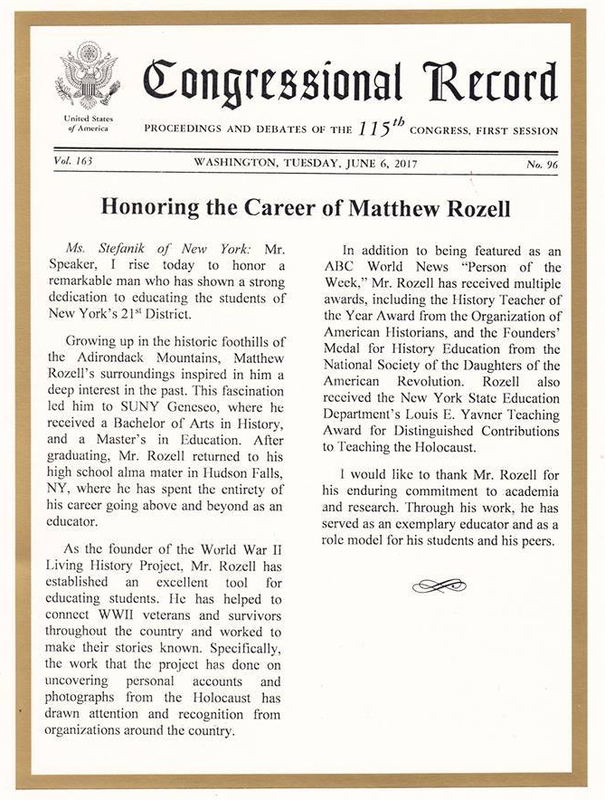 For his dedication to teaching history, Mr. Rozell was named the Organization of American Historians History Teacher of the Year in 2010. In 2012, he was the national recipient of the Daughters of the American Revolution Founders’ Medal for Education. He is a United States Holocaust Memorial Museum Teacher Fellow and a graduate of the International School at Yad Vashem in Jerusalem, Israel’s Holocaust Martyrs and Heroes Remembrance Authority. In 2016 he was the recipient of the New York State Education Department’s highest award for teaching about the Holocaust and human rights. Entered into the Record on D-Day. Apropos. Upon his retirement in 2017, Matthew Rozell was honored in resolutions by the United States Congress, the New York State Senate and Assembly, the Village of Hudson Falls and the City of Glens Falls. 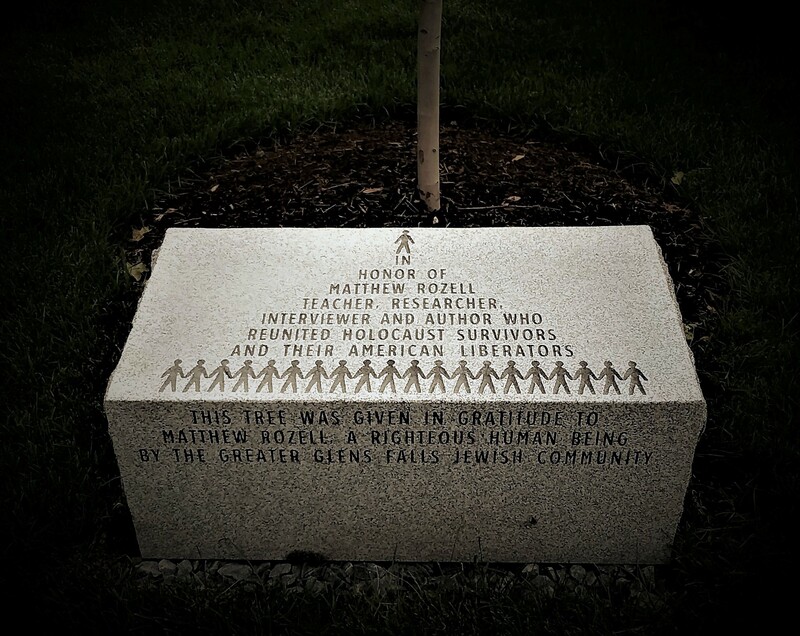 The Greater Glens Falls Jewish Community recognized him as a ‘Righteous Human Being’ with a tree planting and monument his hometown village park in 2018, and he has been honored by the Washington County Historical Society. Largely self-taught as an author, his books have developed a following and have been read by hundreds of thousands. You can follow him at his Facebook page, his Amazon.com page, or his BookBub page, or on Goodreads.